The Department of Education (DepEd) on Monday, March 10 announced that the agency is now accepting applications for the Special Program for the Employment of Students (SPES) 2014. List of requirements, qualification details, download link for application form and deadline of filing application are available here. SPES is an annual summer employment program that invites students to immerse themselves in government as well as hone their sense of leadership and public service. The program is currently spearheaded by the Department of Labor and Employment (DOLE), with the support of other government agencies. Applicants must possess office skills (priority will be given to those with computer-related skills). For out-of-school youth (OSY): provide grades available before dropping out of school or a certificate of indigence issued by the Barangay, stating where the OSY resides. 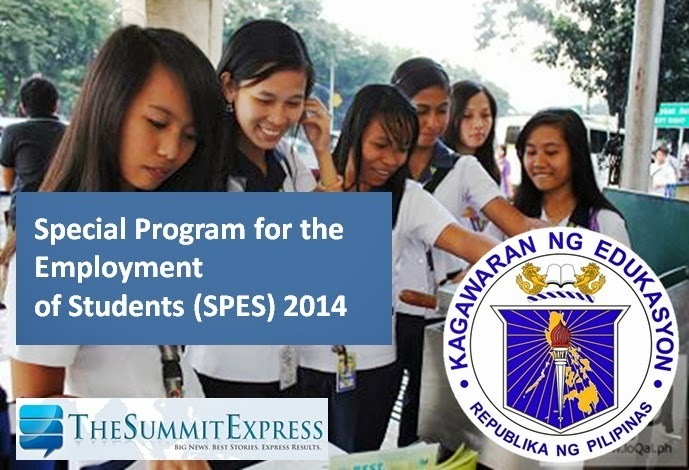 SPES 2014 trainees will be employed for 30 working days under the supervision of the SPES 2014 Secretariat, which is located in the DepEd Central Office. The application period is from March 10-22, 2014, from 9:00 a.m. to 6:00 p.m., Monday to Saturday. Submission of document may be thru email via scanned documents (zip file) with your Name and Date of Submission to youthformation@deped.gov.ph.